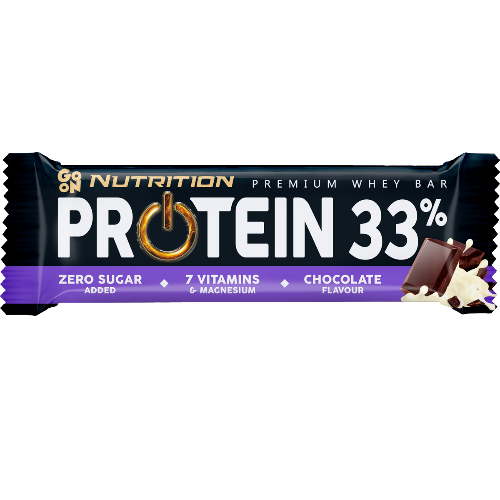 Protein bar PROTEIN 33% is a delicious chocolate bar with a vanilla coating. It provides a good portion of protein and 7 vitamins, important for physically active people. The MPI milk protein isolate and the WPC 80 whey protein concentrate form a perfectly selected composition – as much as 33% of milk protein, which contributes to the growth and maintenance of muscle mass and healthy bones *. Magnesium contained in bars helps in maintaining electrolyte balance, proper muscle work and contributes to the reduction of tiredness and fatigue *. Did you know that two PROTEIN 33% protein bars satisfy more than 80% of RWS (Reference Intake Value) for vitamins that they have in store? The GO ON Nutrition bar – extremely fragile and with a delicate consistency – is a tasty and nutritious snack before, during or after the workout. For an athlete and every busy person. Always when power is needed! * Just one PROTEIN bar 33% consumed regularly as part of a properly balanced diet and a healthy lifestyle will help to achieve this health effect. 31% milk proteins: milk protein isolate MPI, whey protein concentrate WPC 80 (from milk); soluble fiber (corn), peanut nuts, sweetener: maltitole; vegetable fats: palm, shea; 3.5% chocolate (sweetener: maltitole, cocoa liquor, emulsifier: lecithin (from soya), reduced fat cocoa, natural vanilla flavor), humectant: glycerol; soy isolate, cocoa, soluble (acacia) fiber, tapioca starch, salt, flavors, sweeteners: sucralose, steviol glycosides; emulsifier: lecithins (from soy), enriching substances: magnesium citrate, vitamin C, niacin, vitamin E, pantothenic acid (B5), vitamin B6, thiamine (B1), vitamin B12. The product contains naturally occurring sugars.